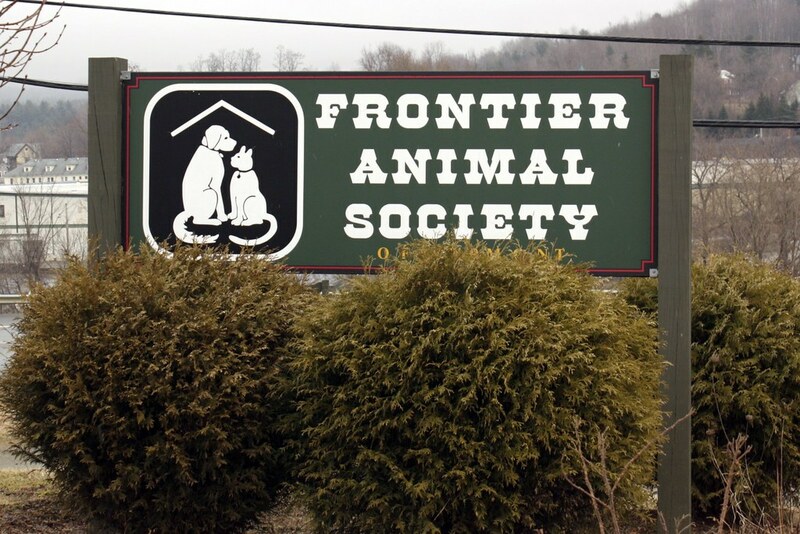 My daughter Amelia is one of the managers of Frontier Animal Society in Orleans County, Vermont. Amelia is a dog trainer and she evaluates and trains all of the dogs that come to the shelter so that they can be more easily adopted. It's quite a responsibility and I'm so proud of her important work. She is also my personal "vet" — she gives my cats their shots. Sunday John and I drove north to visit our home up in Barton but I had forgotten that it was Amelia's shelter duty weekend. I stopped by to visit her there and got a couple photos. Amelia didn't want to disturb the cats in the cat room, so we visited Fancy in the shelter's kitchen. Fancy was brought to the shelter as a stray. She hates dogs, most cats and most people. Here is Fancy's adoption page. But she greets Amelia every morning at the shelter. Fancy lives in the kitchen because she can open doors. She can't yet unlock human doors, though, so when there is no staff present, she is locked in the kitchen. If Fancy is allowed to roam the shelter at night, she goes into the cat room and lets the other cats out of their kennels. 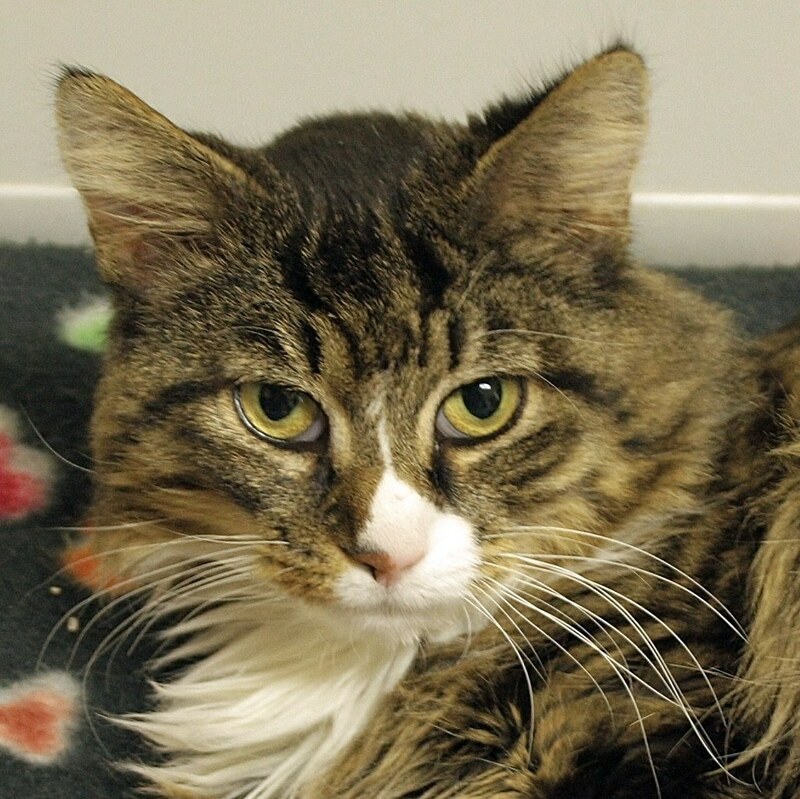 Fancy has some health problems and is looking for the perfect home. I hope her beauty and personality make her easily adoptable. I would like you to notice that I have added petfinder.com badges on the right sidebar. I have one for Frontier Animal Society and one for New Hampshire. I hope that I can help these deserving animals find a home. Fancy's a lovely cat. Hope she gets a lovely home soon. Nobel post:) Sure Fancy is not part raccoon? That sounds like a movie ! a cat opening the doors of the cage ! that's really great (not so for the shelter's personal of course) she could work for a circus. I hope she will find a nice home, she really is a beauty ! Thanks for visiting my kitties. I have voices for several of them, so I think I know what they would say. Have Bamboo. Now Need Panda. mathrecreation: teachers - born or built?